Stansted Village Hall on the first Thursday in every month. You can find everything from sausages flavored with herbs, and wheat and gluten-free, to dry cured gammon and bacon. Chops and loins or pork burgers with apple. 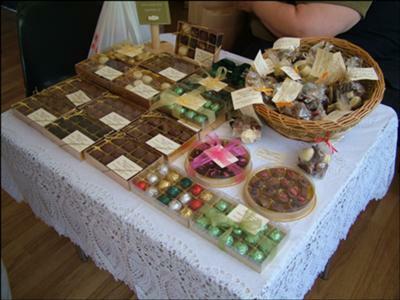 Handmade chocolate in all shapes, and sizes. Milk, dark or white. With a variety of flavors. Wholemeal rolls and loaves, some with nuts and seeds, plaited, cob or loaf. Apples, pears and soft fruit. Pumpkins, butternut squash and marrows, also available in season. Kent cobnuts from the only organic cobnut farm in the country.